When you are a scrappy quilter you end up dealing with smaller pieces of fabric. I don't always buy yardage. I buy a lot of fat quarter bundles and a lot of scrap bags. When you do scrappy patchwork quilts it requires a lot of variety of in fabric. You can't wrap a fat eighth around a comic board. You need something made for smaller pieces. I could just leave them in the bag like the picture but they aren't sorted by color in the bags. It's also really hard to store those bags. I also don't want to spend a lot of money on my fabric management because that means I don't have as much to spend on fabric. So what do I use to store my fabric scraps? 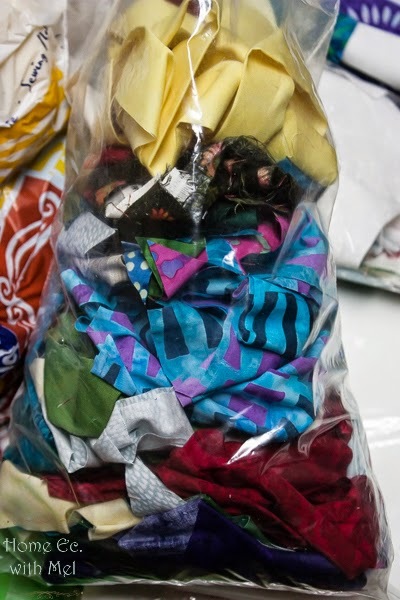 A bag of fabric scraps. Once it gets out that you are a scrappy quilter others will start to give you fabric scraps. I also can't leave a quilt store without a bag of their scraps. If you start to make a name for yourself as loving fabric scraps you'll get contacted by fabric companies to make scrappy projects for them, like my patchwork insulated bag. It's pretty easy to get over ran with them if you don't have a system to store them. The first thing I do is sort by color. If I want blues I don't want to dig through a bunch of fabric to find my blues. I want them at my fingertips. Easy to find so I can just grab and go. Once everything is sorted by color you need to put all somewhere. I don't like boxes I can't see into because that requires labeling and that's just an extra step. I want to spend my time sewing up those scraps not labeling them. So what do I put my scraps in? Plastic shoe boxes. They are the perfect size, they stack well, and they are clear so I can see what color is in each box. You can get them from a bunch of places, like Amazon, WalMart, or Target. They stack nicely under my sewing machine cabinet so they are at my finger tips if I need to quickly swap something out or pick a new fabric. Amazon also carries the comic book boards if you have yardage you need to store as well. Each box holds one color. So all my reds are together, all my blues, ect. Right now I have white, brown/tan, and black in the same boxes as neutrals. Batiks have their own box as do those fabrics that just have too many colors in them to call what color they are. I also have a box from my "strings" those are pieces too small to use for a quilt but too big to toss. I use another box to hold the "kit" I'm currently working on. A quilt kit is all the pieces needed for that project. 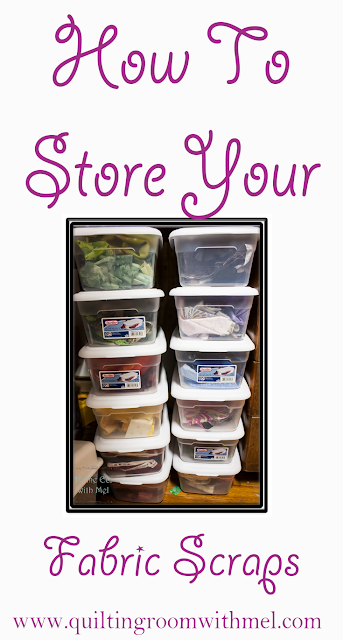 When I get a bag or box of fabric in I try, try is the keyword, to sort the fabric out into the boxes it belongs in. I'm behind a few purchases because life is busy right now. I'm super thankful for that though. You all are keeping me on my toes. Your fabric is so nice and neatly organized! I would love for you to share your sewing related posts at the Stitch It, Blog It, Share It Link Party at BehindtheSeamsSewing.com. Good idea. I like your post. Thanks for sharing.